“If you are so ignorant, I am not going to waste time speaking to you,” Nasarudin said and climbed down from the pulpit. “If you know,” Nasarudin replied, “then what am I here for?” And he left the mosque. There you have a good example of Sufi philosophy, teaching methods and character, all rolled into one story. The abiding message of Sufism is clear: “Don’t listen to preachers or formulas. Avoid the polished sentiments of others. Find your ecstasy in yourself.” Sufis seek a union with God, which is the object of most mystical systems, only they follow a radical path within to get there. Along the way they locate themselves very much in the here and now. And what has attracted me to Sufis, the little that I do know of them, is that they don’t lose their sense of humor along that path, as we shall see throughout this sermon. Sufism is basically a mystical religion of the Middle East, rooted in early Islam and designed to increase the chances of one’s union with God by an ever-deepening experience of inward spirituality. It emerged strongest in Persia, but remains an active world religion today, sometimes called Neo-Sufism, with pockets of adherents in the West. Sufis-in the West, at least-emphasize a traditional unitarian notion that God is one with all life. Sufism has always been a religion of immediacy. Philosophy must be relevant to the moment, to the context of this time and this place. They put little emphasis on dogmatic texts or static preaching and much emphasis on individual teaching and learning. My title today is distilled from this idea. And character? Sufis are usually full of it. This Mulla Nasarudin is quite a character: beloved and beguiling. Sufis prefer to learn and practice their brand of Islamic mysticism through stories with multiple levels of meaning, especially ones that cleverly expose self-delusions or pompous pretensions. Nasarudin is a prime figure in such episodes (although not the only one). In arguments it is common strategy to make one’s point by working up to a Nasarudin story, which then becomes very hard to dispute. “But flies won’t follow my orders,” the King said. Then he thought for a while and dropped the subject. 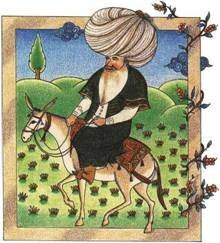 Nasarudin Hoja lived in 13th century Persia and is representative of a large number of what the Sufis respectfully call “wise-fools.” They were an independent and clever lot, possessed by a form of divine zaniness. They rank in influence among the cultural sages. One author summed it up this way: “Fools have been endowed with such a provision that a hundred scholars would be amazed by it.” The teachings contained in wise-fool stories have broad appeal and reach people of all educational levels. Nasarudin Hoja himself went to divinity school in Turkey and attained the religious title of Mulla, only to give up his official post to follow the Fool’s Path to wisdom and survival. Survival is the wise fool’s forte. Nasarudin was starving at one point when he passed through a village and heard that a wealthy landowner was dying. Once there, he felt the old man’s pulse and asked for a meal of fresh bread, fresh goat cheese, and ripe grapes. The servants brought them and left. Nasarudin ate the repast and prayed for the old man. Just as he was leaving the village, his patient died. “Your remedy gave the opposite result,” the villagers complained. Another time, Nasarudin dreamed that someone was giving him nine coins. “Make it ten,” Nasarudin insisted, refusing to accept only nine coins. With a unique blend of serious intention and humor, Sufism has etched a subtle yet significant place in the history of religion. Sufis combine a subjectively sublime philosophy and an appreciation of the absurd with dedicated devotion. It has long been a distinct and popular undercurrent in Islam, compatible with it, spreading throughout the Middle East, although Sufis have often been persecuted, as well, particularly by rulers who don’t appreciate their independent attitude. The Sufi synthesis also draws on early contact with Christian hermits and Greek mystical systems. Some point out that the root of their name, “Suf,” means wool in Arabic, supposedly after the rough robes of white wool worn by early mystics, in imitation of Christian monks. Others claim the name comes from the fact that the sound of the letters S, U and F together have a certain desirable effect. This debate is appropriately ambiguous. Western incarnations of modern Sufism reflect their tolerant, universalist tendencies. Above all, Western students of Sufism must seek authentic written and oral materials and activities that are designed by local Sufis to operate within the students’ own culture, time and circumstance. The bulk of Middle Eastern translations are declared unsuitable because they were intended for specific audiences elsewhere. The philosophy must be reinterpreted anew by each aspiring Sufi. This is quite a contrast from some other more dogmatic religious traditions. I do detect in Sufism a fair amount of dualism and a rejection of this world in favor of that mystical, other-worldly union with God. But what recommends Sufis, I think, is that their route to ecstasy is distinctly inner, and it upholds the dignity and integrity of the individual amid a plurality of paths. They resist most attachments to earthly possessions, but personhood is quite important. Teachers always model their lessons, much as Nasarudin is a model. Sufism insists that it can be taught and learned in many ways, so there is no one convention. A true Sufi must judge authenticity each moment, for true authenticity emerges, again, from one’s immediate context and not from adherence to dogma or leaders. An illustration of the humility of Sufi teachers is the title of one of Rumi’s books: “Fihi Ma Fihi,” which translates: “In it what is in it.” In other words, “You get out of it what is in it for you.” In a system like this, which is so customized to the individual, the Sufi teacher acquires a supreme relational authority. This is paradoxically required for the student to eventually trust him or herself to the degree that will allow the desired inner union with God. Sufi women, by the way, are not so excluded as in most other religious groups. The followers of Haji Bektash, a 14th century master, admitted women to their meetings, calling for “social reinstatement of women” to redress the balance of a society based on male supremacy. Such progress was limited, of course, by wider restrictions, but notable nonetheless. The authority of a Sufi teacher is demanding but benign, and very egoless. It is the main task of the teacher to encourage in the student the right response to needs, not desires. The needs of the student are determined by the teacher. And desires are like clouds, interesting but obscuring; visible but allowed to float on by. Direction from the teacher is to be unchallenged, but not so civil or royal authority, which in its ignorance often treads heavily on enlightenment. One day Nasarudin climbed onto King Harun’s throne. The courtiers rushed to the Fool, and with sticks and stones made him leave the royal seat. Another day the King read a poem he had composed and asked for Nasarudin’s opinion. “I don’t like it,” said the Mulla. The king became angry and ordered Nasarudin to be put in prison. The following week the King summoned Nasarudin and read him another poem. “What do you think of this one?” he asked. Nasarudin got to his feet. “Where are you going?” asked the King. “To the prison,” answered Nasarudin. I really cannot profess to know much about the specific and esoteric religious techniques of the Sufis. Forgive me if I seem to present here an inordinately narrow and oversimplified view of this rich practice. Other than a number of experiences with the Sufi-inspired Dances of Universal Peace, I have never been on the inside of anything Sufi. I have eagerly read Rumi and other Sufi poets, and have tried to research their history, their philosophy and their place in Islam. But they are intentionally vague and paradoxical, because each student must be on the mystical path for themselves, to discover anew the teachings that will serve them. This makes summary and description somewhat difficult (not unlike with Unitarian Universalism). This reminds me that we can only respond to our times with the substance of our lives. We offer of ourselves and are consumed, and in that activity we hope to reach a level of Truth, always self-described. “That is true,” said the poet. Jami was a genius and had many people wanting to attach themselves to him. But, again, this was unacceptable. “Seekers there are in plenty,” he would say. “But they are almost all seekers of personal advantage. I can find so few seekers after Truth.” He was also fond of pointing out that those who tried to overcome pride were likely doing so because they could then inflate themselves with such a victory. No, Sufism demands a perplexingly simple approach. It is an intimate resting in paradox, an active stance which requires patience, self-understanding and a good teacher-a teacher to help one learn how meaning is often elusive, below the surface, behind the obvious words, awaiting exploration. Meaning is often elusive. Sufis seem to revel in this truism, as if embracing it were the next step toward union with the Divine Paradox. Nasarudin was the guest of a distant relative, who put him up in the basement where there was a bed. In the middle of the night, the host was awakened to the sound of his visitor’s laughter coming from upstairs. Another time a thief visited Nasarudin’s house and left with half of his belongings. Nasarudin picked up the rest of his belongings and set out after the thief. “What are you up to?” the thief inquired when he saw Nasarudin following him in the street. There is no definite “How-to-be-a-Sufi” method. That may in fact be its most distinctive religious feature, given the rigid formulations so eagerly offered by many other paths. Therein may also lie its intrigue for me. I am drawn to honest process, especially if it engages humor. Mulla Nasarudin may even get the last laugh. If you visit his tomb you’ll find it behind an iron gate ably secured by a large padlock. But do not turn away in disappointment, for that front gate is all there is; there are no side walls around the tomb. Farzan, Massud. Another Way of Laughter: A Collection of Sufi Humor. E.P. Dutton, NY. 1973. Waley, M.I. Sufism: The Alchemy of the Heart. Labyrinth Publishing, Ltd., UK. 1993.